It’s peak season, and farmers all over the state are harvesting a true cornucopia of goodness, including peaches, pears, blackberries, melons, corn, tomatoes, cucumbers, greens, eggplant, squash of all kinds, and much, much more. It’s the time to stuff yourself with the local deliciousness! 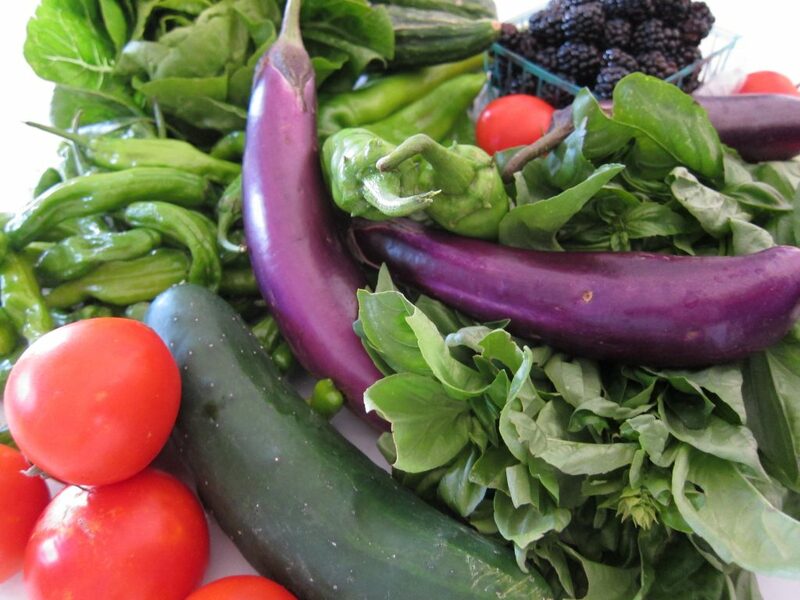 It’s also a great time to preserve the harvest, while it is in season and inexpensive. 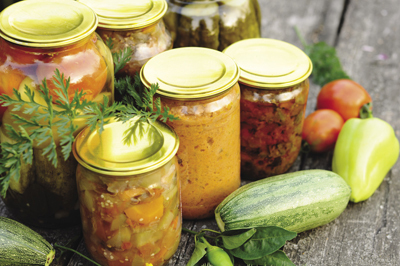 Food preservation can be simple, and there are a variety of techniques from which to choose depending upon your time and materials. Here is an overview of five food preservation techniques available to you; it’s helpful to have a “lay of the land” before deciding on a technique and investing in any supplies! Freezing is the most commonly used food preservation technique. In fact, most people use this method to store leftovers or pre-cooked dinners while taking for granted that it is one avenue towards preserving the harvest. Freezing for long-term food storage, however, requires some know-how to get the best tasting produce out of the freezer, and ample freezer space and a reliable electric supply are needed. Freezing also means thinking about the containers in which you will freeze your produce; you’ll want to avoid the dreaded freezer burn. Before freezing, fruits and vegetables need a bit of processing, such as slicing and blanching (head here for a complete overview). But fruits and vegetables can be kept frozen for 8 to 12 months in a freezer at 0 degrees Fahrenheit. That means you can enjoy it all before the next harvest season approaches. With some simple preparation, most fruits and vegetables can be frozen to keep for 8 to 12 months in your freezer. Pressure canning is required for non-acidic foods including many vegetables like beans and potatoes. A pressure canner (as opposed to a pressure cooker) is required for canning these items, and it is recommended to have some water-bath canning experience under your belt before purchasing and using a pressure canner. But the versatility a pressure canner brings to the home storage kitchen is worth its weight in gold. After the food is canned, they can be stored on the shelf until ready to pop open and eat. 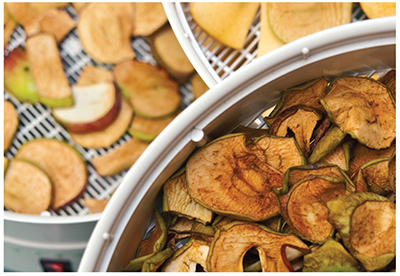 Dehydrating (drying) food is arguably the most efficient, and oldest, method of food preservation. There are several ways to dry food, and the secret to good drying includes heating the food so the moisture is eliminated quickly enough to not affect food flavor, but not at a temperature that is so hot that it cooks the food. Air circulation is also paramount when it comes to properly drying foods as it carries the moisture away from the food. Electric food dehydrators can, of course, be purchased, and cost anywhere between $30 to $260, but we’ve used $30 models with great success in the past. You can also use your oven to dehydrate foods, though this method can be tricky as ovens can run too warm. The oven should be about 140F and the oven door should remain open the entire time to allow moisture to escape. And since ovens frequently don’t hold the temperature accurately, the use of an oven thermometer (and frequent checking) is advised. Candying fruits, also known as crystallized fruit, involves placing whole or pieces of fruit in a heated syrup then draining it, and repeating this process using increasingly strong concentrations of syrup over weeks, or even months. It is the intense saturation of the fruit in sugar that enhances desiccation and creates an environment unfavorable for bacterial growth. Plus, it’s very tasty! Pickling doesn’t need to take long. A “quick pickle”, also known as refrigerator pickles, don’t require canning, and they can be eaten within hours or days of preparation. Quick pickles are simply sliced or whole vegetables that are placed in a jar and pickled in a solution of vinegar, water, salt, desired spices, and frequently sugar. When thinking about pickling, consider delectable dishes from all over the world, such as the Italian giardiniera, pickled onions and eggs in British fish and chips shops, pickled herring in Scandinavia, and Achar in India, a pickle made from mangos, lime, vegetables, and an assortment of other ingredients. 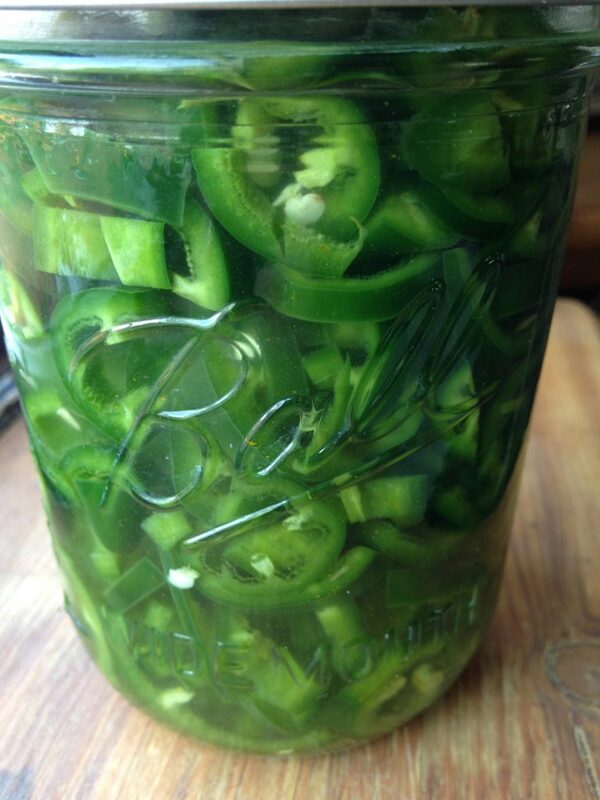 Food can be pickled in a variety of brines, including something as simple as white vinegar and salt for fresh jalapeños.